"A field by the Jamuna- Brahmaputra estuary; some of us were resting on our rifles and Sten gun, when we suddenly saw at a group of fellow freedom fighters walking in a line far away, over the sand dunes by the river. Some of them will return some will not. The scene overwhelmed me. Quickly, I brought out my camera and from that distant took a snap of the Ekatturer Jatri”. 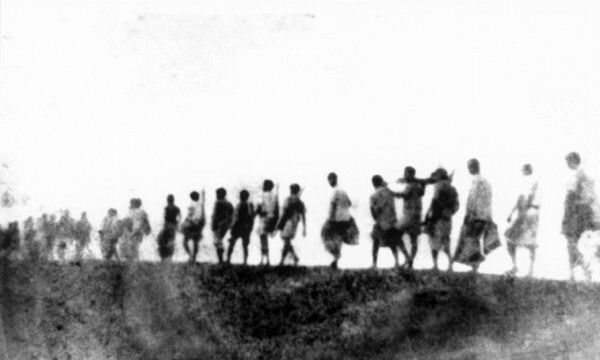 This is the caption of the picture that depicts a group of freedom fighters walking away in the onset of dusk. Like this, about 100 pictures of our glorious Liberation War covered the walls of Nalainikanta Bhattashali gallery of the National Museum, knitting a story untold. Titled “Ekkaturer Jatri”, the exhibition brought forward the pictures that Haroon Habib, a valiant freedom fighter, journalist, writer and a columnist, had taken while fighting in the battle fields of Sector-11. During the war he was recruited as a war journalist by the MujibNagar Government. Using two very ordinary cameras he had taken more than 100 pictures of the Liberation War. Except for a few of these pictures that have been published in different newspapers and magazines and displayed at the Muktijuddha Jadughar, most of pictures of “Ekkaturer Jatri” have been put in view for the public for the first time. The three-day exhibition, commencing on 21st December, 2009 was accompanied by a publishing event of “Ekkaturer Jatri”, an album of 88 photographs from the exhibition, Sonali Eagle O Udbhastu Shomoy, a biographical novel by Haroon Habib and “Haroon Habib: Ekaturrer Jatri”, a commemorative summation of the exhibition. Two seminar sessions on the Liberation War and war criminals were also arranged as part of the event. The creative publishing house Magnus Opus organised the event in association with Gonochaya Shikha O Shangskriti Charchya Kendra, Universal Theatre. Initiatives to make the exhibition happen were taken by Martyred Intellectuals' children-- renowned actress Shomi Kaiser, daughter of Martyred Intellectual Shahidullah Kaiser, prominent journalist Nadim Kadir, son of Martyr Abdul Kadir, and Jaya Taher daughter of Martyr Sector Commander Colonel Abu Taher. A brief inauguration programme was held in front of the gallery where Anwar Faridi, convener of “Ekatturer Jatri” programme implementation committee, introduced Haroon Habib and his works. Dr. Khaled Shamsul Islam Dollar, member secretary of the committee detailed the background of the event. Nadim Kadir and Jaya Taher, along with Habib announced the exhibition open by lighting six candles. Everyone present at the inauguration entered the hall while the theme song of “Ekatturer Jatri” “Muktir-o Mandir-o Shopano tole” played in the background. The uniqueness of the exhibition is in the variation of the subjects of the pictures. Most of the pictures we see of our Liberation war depict destruction and atrocities of the War. Habib's photographs cover a wider range starting from pictures of freedom fighters on operations to shepherd boys celebrating news of victory. Each picture is accompanied by a detailed caption. As spectators walk along the wall of the gallery they are taken into those roaring, uncertain days of 1971. Sometimes they would find themselves in the training camp at the border of Assam, Meghalaya and Tripura, sometimes with the Allies pursuing Pakistani convoys. Looking at the photographs is like travelling through time. Most of the pictures are of the camp at Sector No.11. Habib is not a professional photographer and as a result of time some of the pictures have become opaque. Yet, one can easily sense the danger that Habib had to encounter in order to take the snaps. In a short interview he described his experience of 1971. HH: I climbed up a tree which was used by us as an observation post, to find out the position of the Pakistani forces across the border. Unfortunately, my position was detected by the Pakistani forces and they started firing shells. The picture showing a mortar shell exploding in a nearby field was taken at that time. The Star (TS): Why did it take you almost 40 years to display the pictures to the public? HH: Right after the Liberation War, I used to feel that the photographs belong to me and did not want to use them for commercial purposes. However, as the years went by, I began to feel that I still have some responsibilities towards my country. I need to present the true history of our Liberation War to the new generation. This feeling and motivation from friends and familiy led me to organise the exhibition. TS: Where did you get the camera and films? HH: The first camera belonged to Dr. Humayun Hai. Later when I came to Sector-11, Sector Commander Major Abu Taher gave me his Yashica Camera. Most of the pictures were taken by this camera. It was difficult to buy the films and even harder to print the photographs. We had to travel 60 km inside the Indian border to get to a studio. Most of the time, I used to print the pictures from Shaibal studio that was situated on the Tuha hills of Meghalaya. TS: What do you plan to do next? IH: We are planning a 15-day long exhibition and seminar at Shilpakala Academy on March 2010. I also want to spread the spirit of our liberation war by arranging exhibitions int all the large cities of the country. A picture is better than a thousand words. Indeed Haroon Habib's photographs give us -- the new generation -- an unbiased account of our Liberation War. It tells the stories of the many ordinary students, service holders, farmers and soldiers who fought in the war and whose names were never written down in the pages of history. Thanks to this noble war journalist and freedom fighter, we now have hundreds of rare photographs that stand as proof of the glorious history of Bangladesh. Harun Habib, a journalist, writer and columnist has retired from Bangladesh Shangbad Shangstha, (BSS) as chief editor and managing director. Born 1st January 1948, in Dewanganj, he completed his masters in journalism from Dhaka University and post graduation from Indian Institute of Mass Communication, New Delhi. A good number of his literary works have been published so far, the latest being “Sonali Eagle O Udbhastu Shomoy”. Left: The historical battlefield at Kamalpur, June 1971. Right: Sector Commander Major Abu Taher (seventh from right), Mahendraganj Camp, August 1971.